ArtsHouse will bring some of the UK’s best professional theatre productions to the heart of Caterham with a fresh, innovative programme featuring awarding-winning productions from the Edinburgh Festival, the Brighton Fringe and festivals across the U.K.
ArtsHouse performances and workshops are open to everybody, providing a new hub for theatre audiences in Surrey and Kent who are keen to see cutting edge, professional work in the local area. 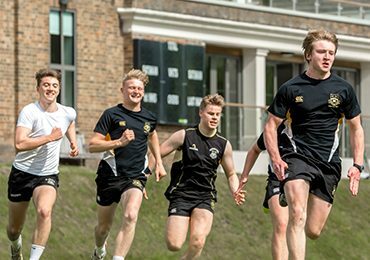 Caterham School’s brand-new Centre for the Performing Arts offers the perfect home for ArtsHouse. We have a brand new, fully kitted 80 seat studio theatre and our 300 seat theatre space which will both host this exciting and diverse programme. An ongoing programme of performances and workshops will run throughout the year providing a variety of genres and styles. ArtsHouse is curated by The Human Zoo Theatre Company, an award-winning, internationally touring theatre company based in Surrey. It’s 1963: the heist of the century is underway. Signals are scrambled, phone lines cut and millions of pounds in cash – stolen. Five days later the first clues are found, the gang is busted and the rest is history. But what about the ones that got away? Four train robbers were never caught. Who were they? And how did they get away with the loot? In our version of events, the anonymous four were women, hired to clean the robbers’ hide-out. After all, in 1963 who would suspect a woman? Great Train Robbery follows these four forgotten females as they leave behind their kitchen-sink lives and embark on a madcap adventure of mischief and mayhem. Using a raucous combination of physical theatre, live music and clowning, we uncover the truth about history’s forgotten women. Great Train Robbery is a family-friendly adventure winning VAULT’s 2017 ‘Festival Spirit Award’. We’re delighted to welcome the highly acclaimed Actors of Dionysus who bring their edge and current new production Antigone, to Caterham as part of our ArtsHouse programme. Actors of Dionysus take Sophocles’ ancient Greek classic Antigone and place it into a dystopian world where fate is written in code and drones flock across the skies. Director Tamsin Shasha said ‘At the heart of this production is aod’s desire to challenge audience perceptions and transform ancient themes into relevant, urgent, and powerful theatre. If you would like to know more or be put on our mailing list, please do not hesitate to contact the friendly ArtsHouse team on info@caterhamartshouse.co.uk. A huge thank you to The Human Zoo Theatre Company who curate the Caterham ArtsHouse! We were thrilled to welcome acclaimed poet Luke Wright to Caterham to kick off our 2017/ 18 ArtsHouse programme with an energetic, cutting edge poetry performance. Luke writes and performs bawdy bar room ballads about small town tragedies and Westminster rogues. His fast paced, witty poems are crammed full of yummy mummies, debauched Tory grandees, maudlin commuters and leering tabloid paps. His live shows are enjoyed by thousands of people across the world every year, where he mixes the wistful with the downright comic to take audiences on an incredible emotional journey. The much acclaimed production of ‘Austentatious’ launched the Caterham Artshouse. An entirely improvised comedy play in the style of Jane Austen, the production received 5 star reviews following an extensive UK tour. To read a review of Caterham ArtsHouse’s launch production click here. Three gnarly fortune tellers live apart from decent society, amongst the rats in an old junk yard. Eager to teach the selfish world of man a lesson, they prepare a fortune reading that will destroy a throne and everything around it. The witches go about plotting the fall of Macbeth, rehearsing what they hope will be the bloody and catastrophic aftermath of their prophecy. The three actors brilliantly played the keys roles with humour and violence where appropriate. The musical interludes lightened the play momentarily whilst instantly bringing the audience back to the reality of the storyline of Macbeth. The immersive set was made entirely of recycled objects, and deranged cast played Macbeth, and his wife, and all the other major characters, swapping roles like a gory game of pass the parcel. 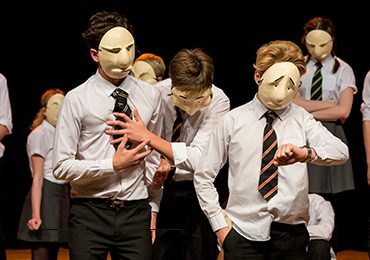 Caterham ArtsHouse hosted one of its most moving and creative productions to date. Scorched presented the true story of a WW2 veteran, following his mind sinking into the sands of time. The production used physical theatre, incredible projections of animated tattoos and puppetry to tell Jack’s story of the Battle of Tobruk, from the armchair of his rest home. 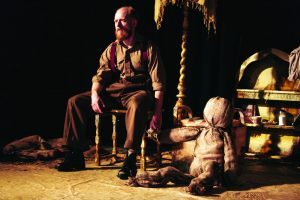 Robin Berry’s performance of the older Jack was sensitive and convincing, gripping audience members as he transformed into his younger self. We are delighted that Caterham ArtsHouse has been able to bring such innovative and visually striking theatre to Caterham! Two fools take to the stage to lead you on a poetic journey through the most surreal, silly and forgotten parts of your imagination. Love & Rabbits is children’s poetry for adults. Taking inspiration from Spike Milligan and Edward Lear, Lewis Carroll and Dr Seuss, two performers create scenes, stories and sketches out of a handful of props and some silly poems, to enthrall and entertain you. Join this tattered troupe as Luna’s tragic tale unravels for the first time. But why tonight? A Tim Burton-esque patchwork of puppetry, poetry, movement and live music. Tommy, 22, lives with three generations of his family. They’ve learnt to ignore the strange things his nan says over dinner, and the bizarre rumblings coming from the attic. Horribly honest clowns and questionable cabaret acts ignite the stage with Human Zoo’s trademark live music, puppetry, poetry & movement.